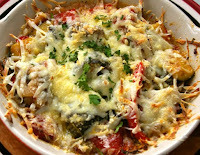 The Cook's Corner Blog: What Meat Goes With Ratatouille? The question, "What meat goes with ratatouille? ", is the one that readers ask most often. Well, just look at the ingredients that go into it: olive oil, garlic, peppers, eggplant, tomatoes... don't they remind you of Greece, of North Africa? And what's the meat of choice there? Personally, when I have some ratatouille in the fridge I usually make it my no-meat meal of the day. I try to have only one meal with meat each day, the other main meal being either a vegeterian soup like soupe au pistou with parmesan cheese on top, or an omelet or frittata with a salad, or an egg salad sandwich on my fabulous homemade multigrain bread with a carrot salad -- that sort of thing. Breakfast is always oatmeal. I like it plain and cold, or au gratin like in this picture, or in a quiche or over some pasta. But if I'm going to have my ratatouille with some meat, then for Epicure's sake let it be a couple of lamb chops. Or a slow-simmered lamb stew, yum! And if it's summer and I'm invited to a steak barbecue (I don't own a barbecue myself, too many mosquitoes around here! ), then I'll bring some ratatouille to eat cold, as a chutney... the combination of tastes is simply awesome. By the same token, it will also go well with just about anything cooked on the grill. The thing to remember is that ratatouille is a strong-flavored dish and it will overwhelm anything bland, so try to pair it with something that will work with it. If in doubt, try it and let your taste buds decide! The above taste experiences will only happen if your ratatouille itself is up to it. 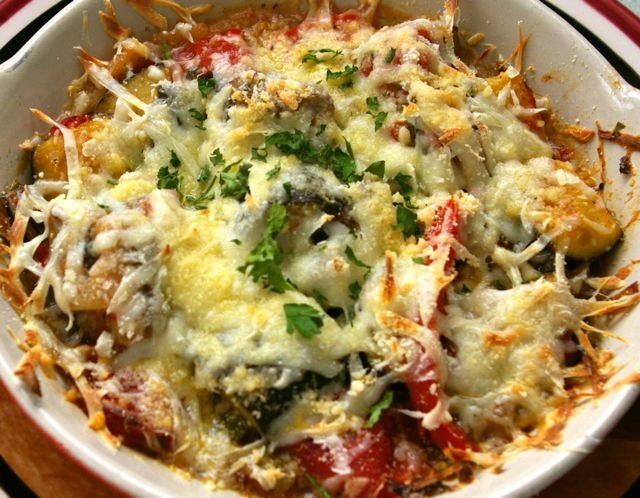 If you need some ratatouille recipes, look no further than my previous post, where you will also find several recipes, including a link to the Julia Child ratatouille recipe from Mastering the Art of French Cooking -- as well as the history of ratatouille.